I didn’t know it at the time, but my new addiction to athletics was helping me to quit some of my old behaviors like smoking, partying and leading an unhealthy lifestyle. What worked for my new addiction was that it fulfilled many of the rewards I got from my bad behaviors. Running gave me an activity to do when I was bored, it also gave me a release and an endorphin boost from the exercise, just like smoking did for me. Muay Thai replaced many of my partying tendencies because it gave me the social acceptance of a team and the recognition I craved. Being a club kid had defined much of my youth, but I knew this was not a long-term solution for my needs. I needed to get my social fix from a group of people that valued something more than dancing and partying until two in the morning. Figure out your cues – When do you get the urge? Where? With whom? Did it occur after a specific action? – Once you realize your cues, you are more aware of the habit and can move to step two. 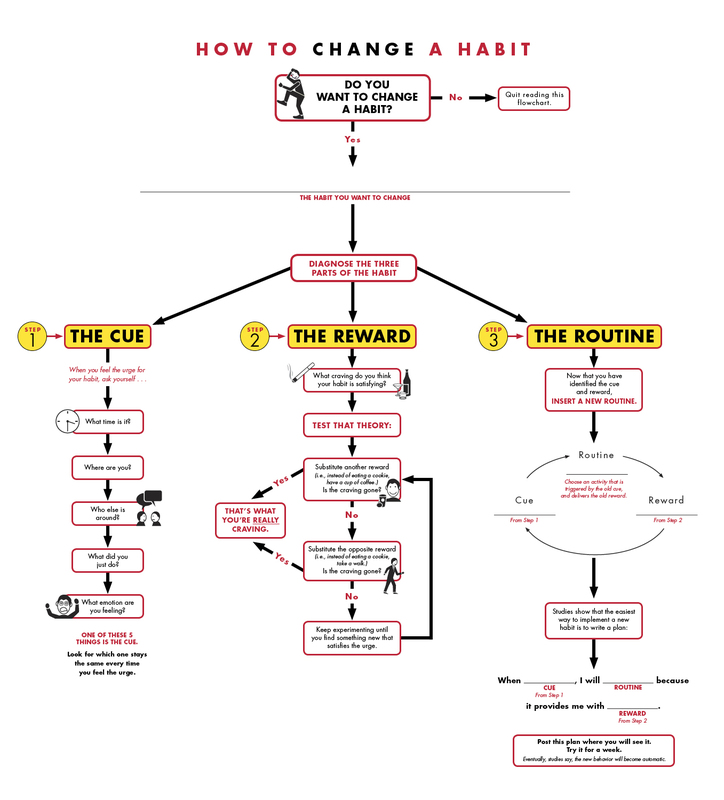 Pinpoint the reward – What does your habit do for you? Does it make you relaxed, awake, feel loved, feel accepted, etc.? Find a healthy replacement – next time you get the urge, do another action instead that gives you the same reward. How did I become the girl that could eat ONE cookie and put the box back?! For example, let’s say that you realize that every night after dinner you want a cookie (or more like the whole box). After dinner (the time of day) you discover the cue. Then you pinpoint that eating cookies makes you feel loved because your mom used to bake you cookies when you were little, and you felt like she did that to show you her love. You decide to instead of eating cookies after dinner to call your best friend and talk because that always makes you feel loved and good. She talks to you about your day and hers, and when you get off the phone, the cookie urge is gone. That exact example may not work for you. It certainly wouldn’t work for me, as I don’t associate sweets with love at all, but it gives you an idea of how the three-step process can operate. Check out this nifty infographic PDF for more details and tips. It’s a good cheat sheet if you don’t have time to read the book. You might also want to check out my blog on willpower! The best thing I got out of the book was that being honest with yourself is the key. You have to acknowledge what you want and what your bad habits are covering up. I know I have done my share of self-medicating with bad habits and I still backslide when I’m not paying attention. Today I’m all about finding a healthy way to moderate. I’m no longer a smoker, but I can have a cigarette once in a blue moon when it feels right and not go back to smoking. I’m no longer a club kid, but I can go out for a night of drinks and dancing and not derail all my life responsibilities or make bad decisions. To be a healthy, person who can eat ONE cookie out of the box and not go back for ten more I have had to get honest with myself as well as make sure my nutrition is in check. I find this often takes the form of asking myself what it is I want from my life, my friends, my partner and asking for it and working towards it in a mature way. I have no one but myself to blame for the way I feel, so when I am bored, stressed, anxious, lonely, angry, etc. and find myself reaching for a bad habit instead of a good one, I check myself… and then I usually head to the gym where I know my salvation lies. An easier solution to breaking habits? If you are having a hard time narrowing down your cues and rewards and making a direct replacement, just focus on creating new, healthy habits. Want to lose body fat? Don’t focus on avoiding sweets and cutting calories, focus on adding more protein and veggies to your daily meals. Want to quit drinking so much? Go to the gym at night instead of happy hour. It’s much easier on our brains to create new habits than to concentrate on breaking old ones.